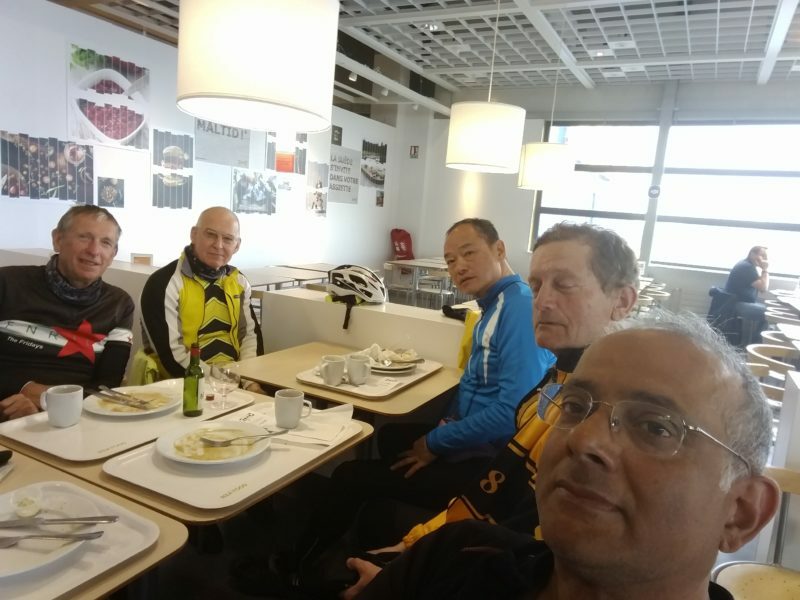 Having said farewell to our colleagues on Wednesday March 3rd, the remaining, small group of 5 trudged out of the Hotel Ibis in Arras and headed northeast towards Lille and Roubaix. 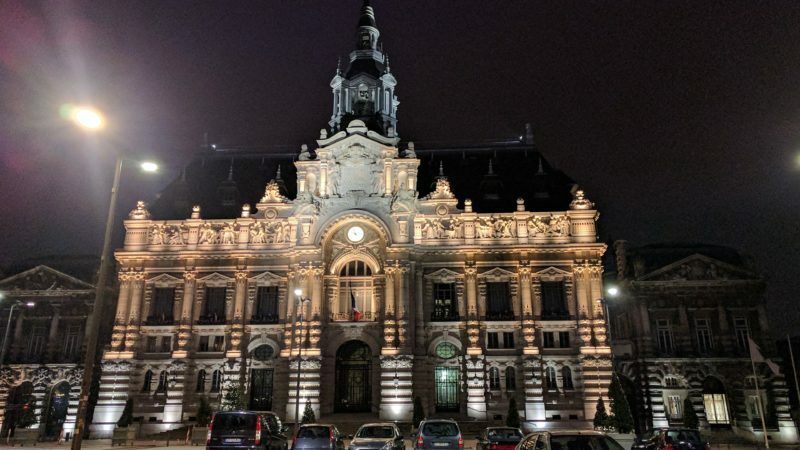 As nobody was really willing to do the full journey out through the forest, I hastily planned a route through some villages that would skirt around Lille and end up in Roubaix – a journey of around 45 miles. The rain that fell was moderate and steady and the pace was very slow. We got cold enough after about 1 hour to take shelter in a Carrefour supermarket to get warm. I bought some Snickers to cheer up the gang and we headed out into the rain and low lying cloud once more. With speed averaging around 9mph we made very little progress in the morning. 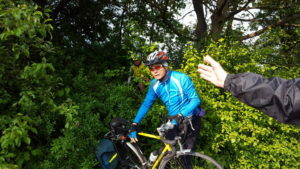 I even had a puncture so morale was very low as we eventually reached the outskirts of Hénin Beaumont. Suddenly we were in a retail park and a site for sore eyes greeted us in blue and yellow. 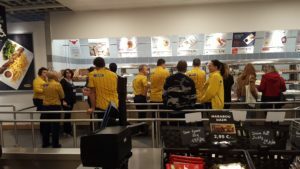 IKEA! 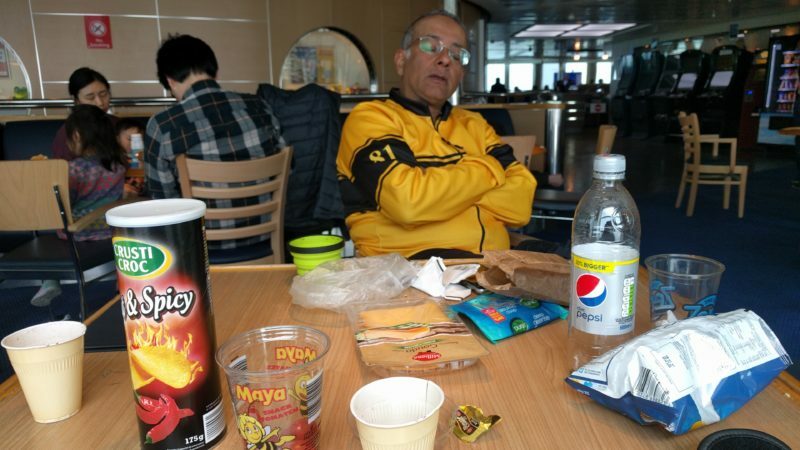 We locked up our bikes and headed in for a lunch of Swedish meatball and fish and chips. Very nice it was too. The rain had gone by the time we came out so IKEA turned out to be one of the highlights of a dull day! Well, there was another highlight in store for us as we headed on past Lille. My route was very sketchy and the only detailed maps we had were on phones or my Garmin. John Dadson once told me that trying to plan a route using a GPS was like trying to look at a map through a keyhole. With the slow pace we were also routing through one of the busiest cities in France at peak time. The quiet road that I could see on the Garmin turned into a dead end as we ran parallel and then crossed a railway line onto a bridge which was completely closed and blocked off. There was no choice but to go back and onto the busy D48 heading northeast. It was very busy but at least cycleable and we continued to make progress until I saw a sign saying Croix straight ahead, Roubaix to the right. A quick decision and before I knew it we were on a motorway which showed on my Garmin as a D road! Stuart’s scars from the bramble battle. With cars merging from the right and horns blaring out the obvious to us we searched for options until a bridge appeared. We jumped behind the barrier next to the bridge and fought our way through the brambles and stinging nettles. 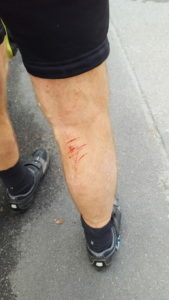 Stuart came off the worse after losing a fight with the brambles but we all made it safely through to Roubaix. Ricky points out where we hacked our way through. 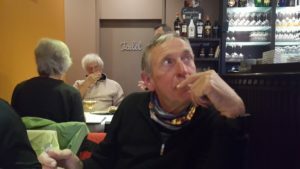 We locked up our bikes, had a quick shower and then wandered into Roubaix for some local cuisine. The townhall was quite an impressive edifice! John Dadson, our new Pump vice-President. He got my back tyre up to 100PSI! 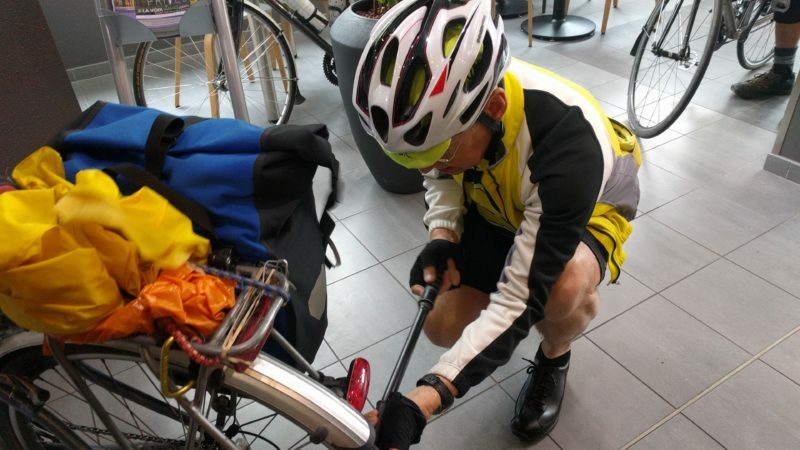 Ricky decided to cut out the last two days and head straight back to Calais avoiding a fair amount of mileage and the early morning dash for the coast. 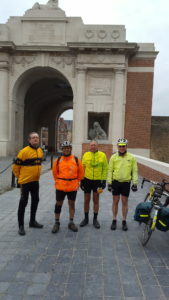 We still had 4 hardy men to complete the final sections starting with the border crossing at Comines. We stopped here to enjoy the amazing townhall. John Eden told us how the brick was laid out in English bond, where the bricks are laid in alternating layers of headers and stretchers making the walls strong – a method used in civil buildings. We had a leisurely lunch outside the local Spar Express shop, where I was shocked to find that Stuart’s bottle of beer was less than half the price of my yoghurt milk drink. In the afternoon, we followed the ridge past the crater remnants of the huge landmines exploded by the British before the attack over the ridge. The series of explosions were the largest set of non-atomic, man-made explosions ever. 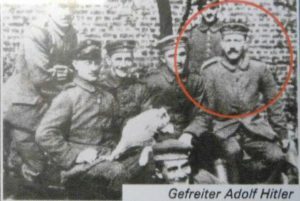 Churchill claimed to hear the bang in London! 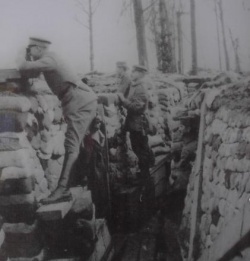 The Spanbroekmolen Mine Crater, also known as Lone Tree Crater, is the site of the largest of 19 mines blown by the British Army in the early hours of the morning of 7th June 1917. 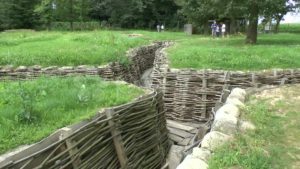 The road skirted the periphery of the Ypres and at Wijtshat we visited Bayernwald, a German trench complex famous for hosting Adolf Hitler as he was wounded. 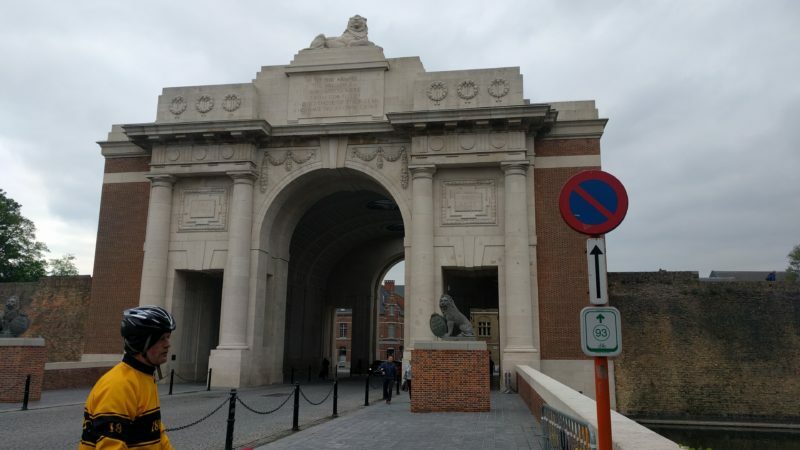 We headed onto Passchendaele which is a large memorial park nowadays. 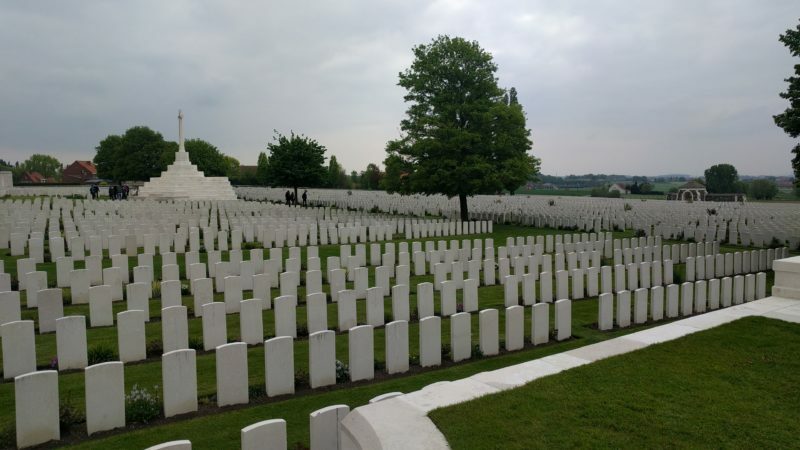 Frank had sent me a request to look up his cousin’s grandfather at Tyne Cot so we could put this massive cemetery into some context. 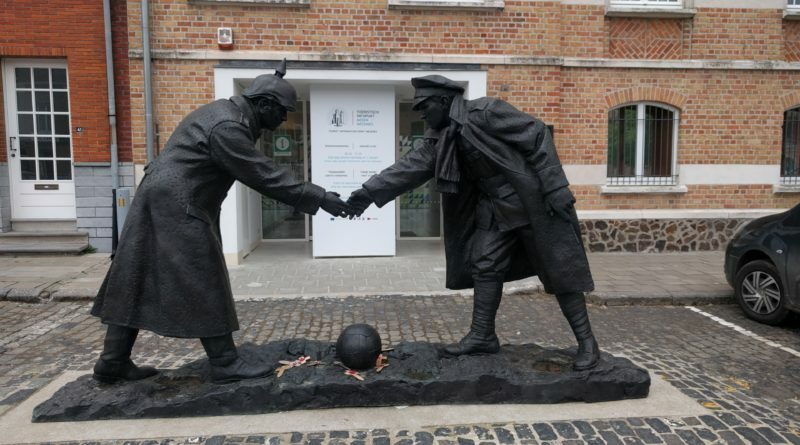 There is a circuit around the battlefields starting at the museum in Zonnebeke. 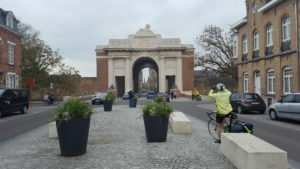 After such a long day we missed the last post at Ypres by 10 minutes. Our final night was at the delightful town of Poperinge. The hotel Steve booked was pretty impressive but our rooms were in a separate house. Stuart and I made a mad dash to the Lidl to pick up a picnic for the ferry journey home. 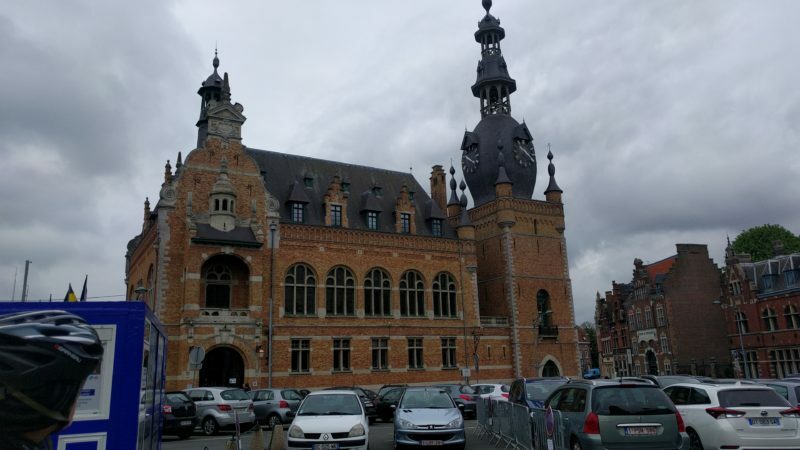 Dinner in Poperinge was pricey but at least I was kept amused by the man who bore an uncanny resemblance to our sainted foreign secretary, at the table behind Stuart. Saturday morning saw us make an early start after a huge breakfast. The dash for the coast saw us going mostly downhill or on flat roads with a tail wind. I think we had a moving average around 16 mph but we needed it. Made it to the ferry with 45 minutes to spare. 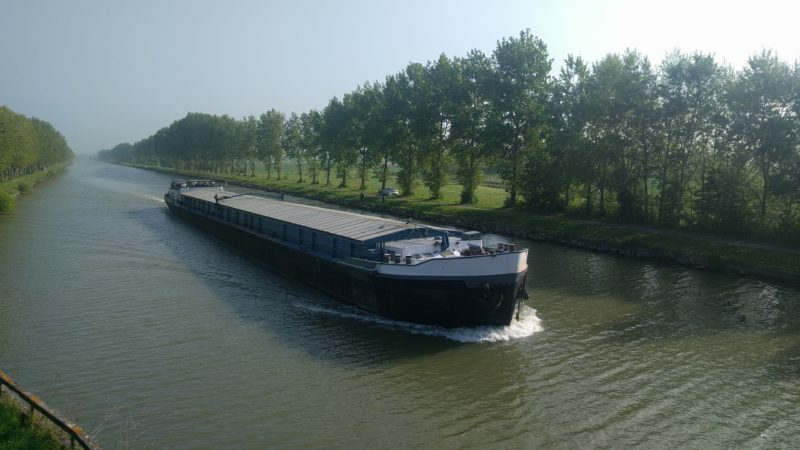 Barge on the Canal du Boubourg. I admit the booze cruise was a bit exhausting and I may have dozed off very briefly. The return from Dover went smoothly and Ricky was sitting on the same train after his own adventures following Google maps across fields and farm tracks so I guess it was alright in the end. 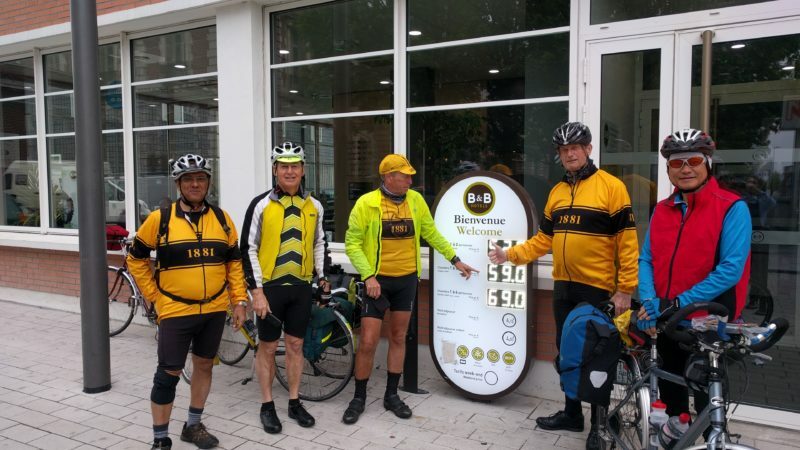 People started and finished in different towns; having planned the route, I guess it was fitting that I was the only person to complete the entire tour.My final mileage was 602km.